Personality test based on color. Is there a better alternative to Aliquis? Is Aliquis really the best app in Health and Fitness category? Will Aliquis work good on macOS 10.13.4? 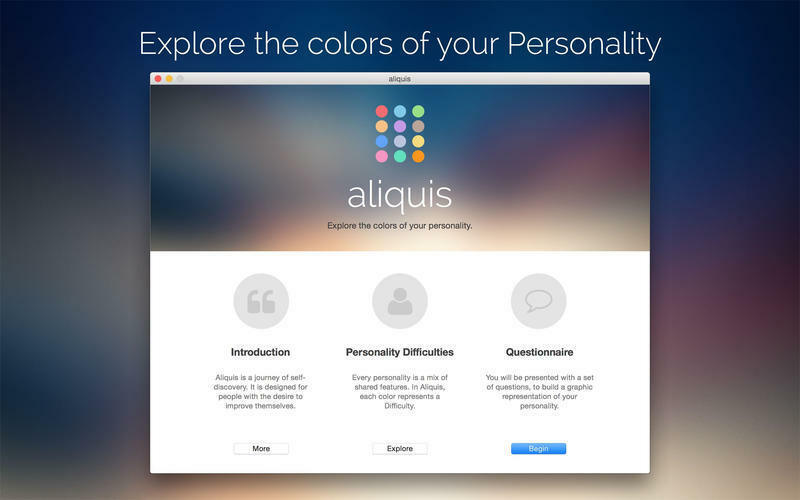 Aliquis lets you explore the colors of your personality. Aliquis helps you to identify your deficiencies of character by tracing a visual map of your personality and bringing out some of your most challenging and difficult tendencies. The personality is our own ways of thinking, feeling and behaving, which make us an individual. Every personality is a mix of shared features from different difficulties. Aliquis evaluates the presence of a personality difficulty, creating an assessment for each one of them. It is a software tool for self-discovery and growth. Added the ability to print the graphics and charts. Fixed printing problems on some configurations. Aliquis needs a rating. Be the first to rate this app and get the discussion started! 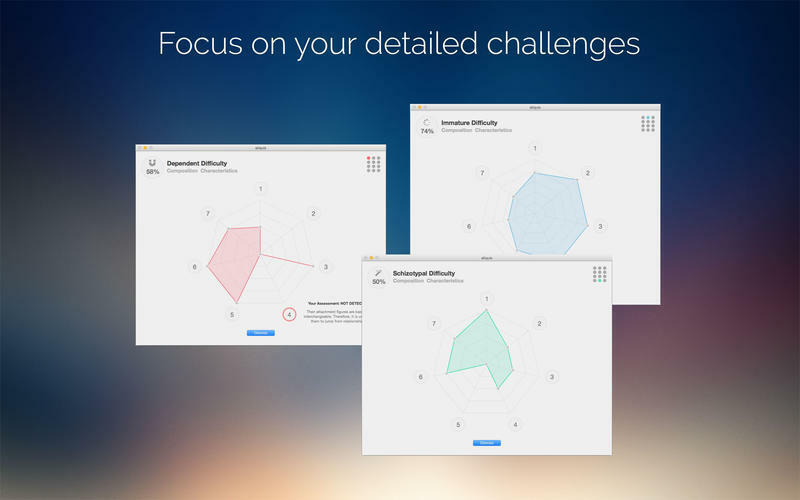 Aliquis builds a graphic representation of your personality, and lets you explore the results. 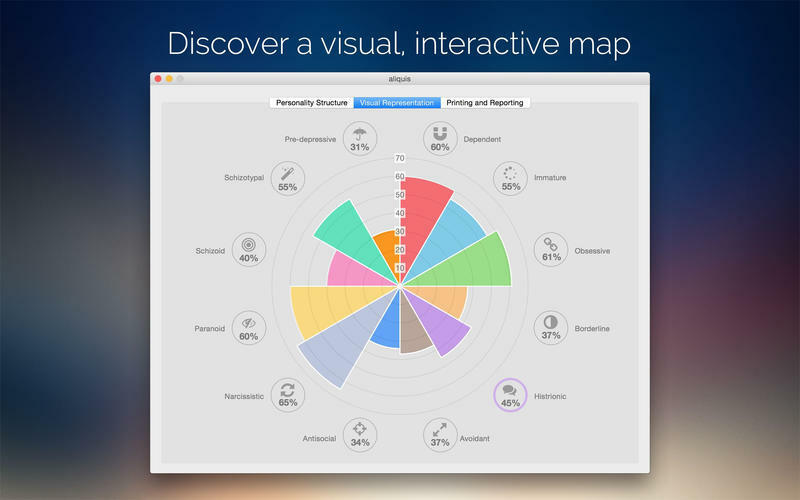 It works by tracing a visual, interactive map of your personality. Personality Difficulties are twelve challenges in cognition, emotions and behavior, related to interpersonal functioning, control of impulses, fear and anxiety issues. In aliquis, each color represents a personality difficulty. Meet your Colors: Aliquis evaluates dependent, immature, obsessive, borderline, histrionic, avoidant, antisocial, narcissistic, paranoid, schizoid, schizotypal and pre-depressive difficulties. Simple and Fun Aliquis guides you in the process of interpreting the results and analyzing the details. It is completely visual and interactive, simple and fun to use. Pro and Amateur Aliquis is perfect for psychologists, psychiatrists, coaches, counsellors, and other professionals. It is also ideal and fun for the family and friends. Full Report Because personality is a dynamic process, you may want to compare your answers with future results. Aliquis lets you print or save a PDF file with your full-report document. Aliquis was developed in close collaboration with a group of dedicated mental health professionals to produce a reliable software. However, it must be emphasized that it is not a tool to be used to diagnose personality disorders or to replace the advice of a healthcare professional.